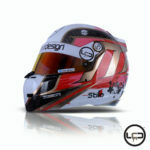 These stylish helmets are the world’s first helmets to feature Elite Diamond Concept coating and 24 carat gold leaf finishing and are a result of a collaboration between Liquid Colour Design and artist Bradon Seaber, a long time friend of LCD. Liquid Colour Design are a bespoke paint shop and studio and recipients of the 2017 House of Kolor Prestigious Painter award in 2017. In their studio, located in the village of Ballycarry, Co. Antrim, Iain Baldwin oversaw the application of the luxurious paint finish and the gold leaf. 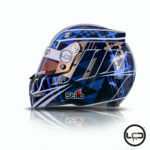 Working to designs produced by Brandon Seaber Designs both the red and blue helmet were produced over a period of two weeks. 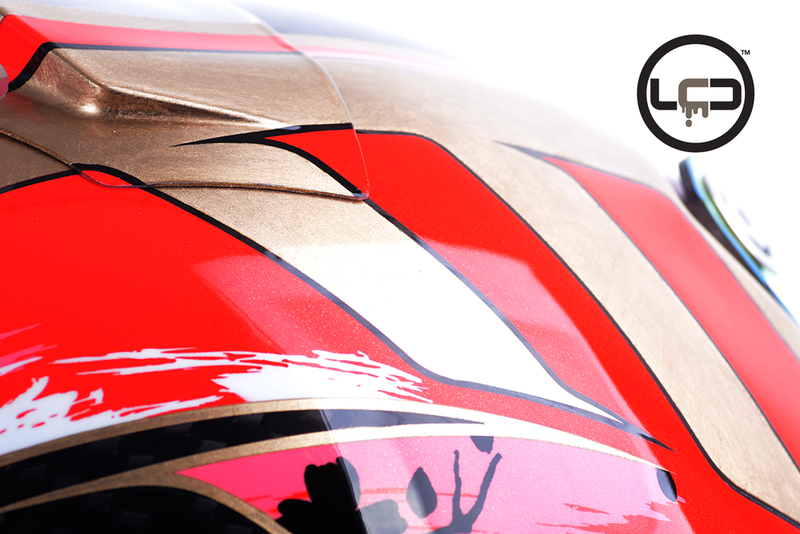 The coating protecting the paint work and the gold leaf is a highly specialised coating produced by Elite Diamond Concept. This uniquely shiny and extra-tough finish incorporates glass and diamond flakes to make for an incredible finish. This Elite Diamond Concept Coating was developed for high-end interiors, such as luxury yachts and jet aircraft! 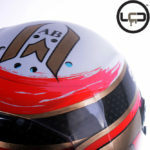 The bespoke paint and gold leaf finish on these helmets was designed for renowned Italian racing driver, Raffaele Marciello. 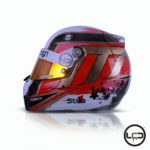 He’s not the first driver Iain’s studio has painted helmets for, previous clients include former F1 driver Martin Brundle and WRC driver Kris Meeke! 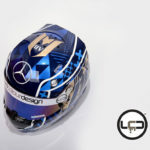 In addition, Iain’s specialist studio also handles other vehicle artwork, including bespoke liveries for trucks, cars and aircraft. We’ve launched a great new Website! Finally, after much effort, we would like to welcome you to our new website which we hope will give you a far more user – friendly shopping experience. Our aim was to look at the site through the eyes of the customer and make it easier to identify the products required for specific projects. We also tried to look through the eyes of the artisan or craftsperson and we have had the majority of our products re-photographed in a way that makes it easier to see exactly what you are buying and where possible we will have images of the effects that you can achieve for inspiration. 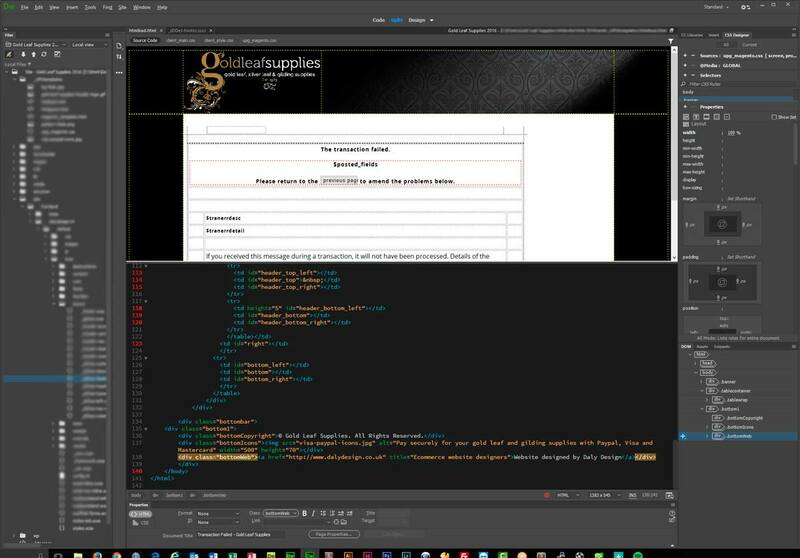 We enlisted the help of our trusted web designers Daly Design www.dalydesign.co.uk who, having worked with us since 2007, understand our business inside and out. We can’t recommend Paul and his team highly enough as their technical & design expertise were essential in creating this new site. The new website is built on modern technology, offering a suite of new features with the prospect of more still to come. It is fully compatible with mobile devices and will automatically resize itself to give the best experience regardless of device. The brief for Daly Design was to create a clean, uncluttered space that flows easily from section to section and gives clear information about the products that we sell. In addition to this we also wanted to reinforce our brand as a major world supplier of gilding and specialist decorating products, providing quality products at competitive prices and full technical back up from our knowledgeable staff. It was also important to showcase our clients work as we are always impressed with the talent of our clients and the wonderful finishes that they create using our products. All the images in our banner heading are of clients work and we have also improved our client gallery making it easier to search for images according to the type of works produced. We decided to add contact details to the gallery so that you can make contact if you like what you see and would like to discuss further projects with them. We don’t use any stock photos on our site. New high-resolution product images were produced in-house using high end cameras, lighting and colour calibrated digital hardware. We don’t use any stock photos on our site as we wanted it to be a true reflection of our clients work and the prestigious projects that we supply for. 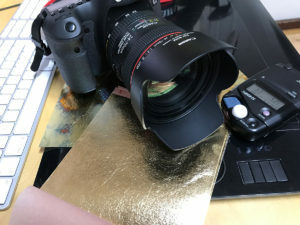 The manufacturing companies that we work with have provided us with some great photographs but we have also enlisted the help of a professional photographer for our gold leaf section. We are very lucky to have Adam working with us who is an excellent photographer and has contributed so much to the development and visual aspect of the site. I don’t think he wants to photograph another brush for a very long time! Our logistics was another area for improvement and we have streamlined our carriage costs and options and have also opened up our online shop to a wider geographical area. 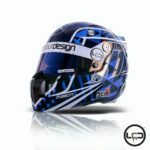 As well as the UK and Europe we can now accept online orders from the USA, Canada, Australia, and New Zealand. If you are outside any of these destinations, please email us and we can quote you for delivery costs and process your order in this way instead. We will be continually adding new and interesting products to our online shop and also lots of interesting information to our Tips & Techniques and Client Gallery so keep popping back from time to time. Thank you for your patience whilst we were creating this new site and we hope that you will find it interesting. We welcome any feedback and please feel free to contact us with any suggestions for new products or features that you would like us to add to our site. 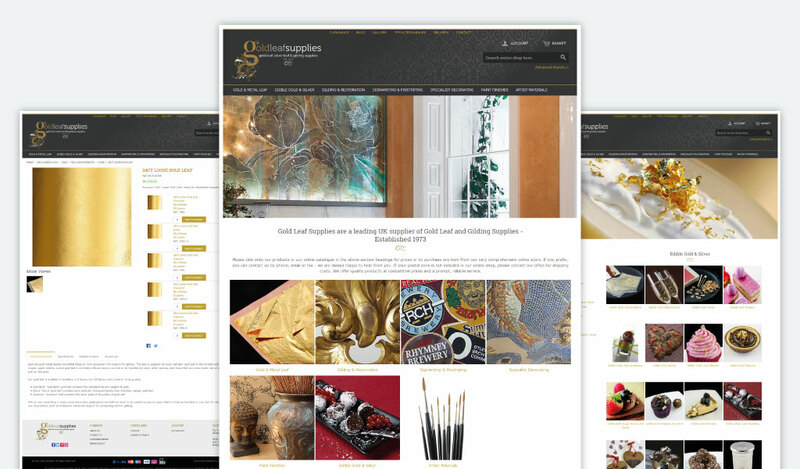 We are always looking for ways to improve the site for you, the customer – to make our site the premier destination to visit for purchasing gilding and specialist decorating supplies. If you haven’t visited before we look forward to welcoming you to our shiny new world! 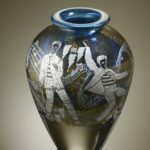 Last year we featured in our blog the Celebrity Doodle fundraiser for the British Glass Heritage Foundation. Allister Malcolm was inspired by the story Damien Hirst giving a cabbie a doodle as a tip, which the cabbie then turned around and sold for £12,000, the fundraiser aimed to take doodles from celebrities and glass artists would then turn them into unique glass art. These would then be sold to raise money for charity. 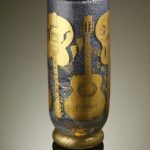 Jonathan Harris, a world renowned glass artist and engraver, has recently completed three stunning glass vessels for this fundraiser. 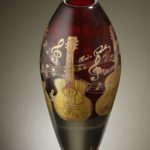 Each intricately decorated vessel was handblown and engraved by Jonathan and features designs inspired by Elvis Preseley, his guitars and his famous logo ‘TCB!’ These designs were inspired by celebrity, Mark Hill – co-presenter of BBC2’s ‘Collectaholics’ and his lightning-bolt doodle. The designs were painstaking carved through multiple layers of 24ct gold and sterling silver leaf that we donated to the cause. The complicated final stages of producing these gorgeous, one-off pieces was done in front of a delighted crowed at the International Festival of Glass in Stourbridge. Jonathan, working together with Allister Malcolm and Dan Ridgway at Allister’s studio, completed the tricky final reheat stages that go into creating these reheated cameo pieces. These fantastic art pieces are generating a lot of buzz through Jonathan’s own private collectors, Elvis and music fans and glass lovers who are looking for a unique, one-off artwork to add to their collections. All three pieces will be offered at auction at the Decades of Design Auction on 24th October with all proceeds going to the The British Glass Foundation’s charity. All of the other ‘Celebrity Doodle’ pieces, that also included doodles by other celebrity’s including Beverly Knight, Frankie Valley, Raymond Blanc, & Lenny Henry to name but a few, will be auctioned later in the year to raise funds for the Glass Foundation. You can find more details on the auction at Fieldings Auctioneers. What Is The Difference Between Transfer Leaf and Loose Leaf?